There are many different causes of knee pain. Some of the most common causes can be found listed below. As we age, the cartilage in our knees wear down. This causes the bones in the knees to grind against each other, causing pain. A tendon connects muscle to bone. The tendons of the knee can be inflamed, oftentimes due to overuse or injury. The inflammation of the tendon can cause pain. Sometimes there can be a fluid-filled cyst (usually due to arthritis) in the back of the knee. This can cause a feeling of tightness and pain. A bursa is a fluid-filled sac that cushions the tendons and muscles near your knee joint. When this is inflamed, it can lead to pain. A pulled muscle, or muscle strain, occurs when a muscle is stretched too much. This can cause a tear in the muscle, leading to pain. Treatment will depend on what is causing your pain. Always consult with your physician to decide what is the best option for you. Limit exercises that add stress to your knees like running or jumping. Try swimming instead! Maintain a healthy weight. This will keep extra stress off your knees. Medication may help to relax tight muscles, decrease inflammation, and to provide pain relief. Your physical therapist may evaluate what activities are increasing the pain in your knees and teach you better ways to perform them. He/she can also teach you different exercises that will strengthen the muscles around your knees, which will help decrease pain. Treatment may include heat, ice, massage, ultrasound, and electric stimulation. 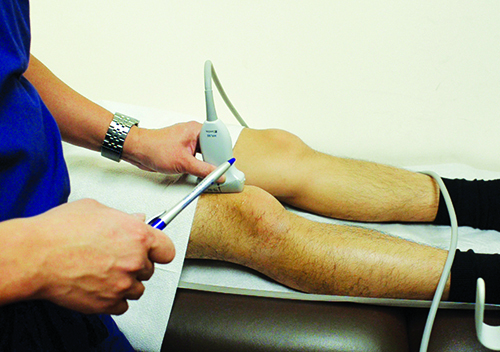 Precise, ultrasound-guided injections of medications or steroids into the your knee can decrease inflammation and pain. Sometimes fluid can build up in the knee for different reasons, such as infection. This fluid buildup can cause pain. When a knee is aspirated, the fluid buildup is removed from the knee. Hyaluronic acid viscosupplement is a type of medication with a consistency similar to lubricant. When injected into the knee joint, they can help to provide more cushion and lubrication. This is helpful especially if the cartilage in the knee is worn down. A procedure that will remove the sensation of pain that comes from the nerves in your knee. Before this procedure can be performed, diagnostic nerve blocks will be performed in order to determine if this procedure is right for you. Regenerative Medicine is a new treatment for pain that uses your own body cells to help heal injuries that may be at the source of your pain. Although it is not covered by health insurances, it can help heal injuries that might otherwise require surgery. Please check our page about Regenerative Medicine to learn more about this new cutting edge medical technology. If you’ve tried all other treatments, surgery may be your last option. Surgery should only be considered as a last resort. Partial or total knee replacements replace part or all of your knee, depending on how much of the knee is damaged. The information on this website is not meant to diagnose or treat your pain. Always consult with your physician to decide what is the best option for you.